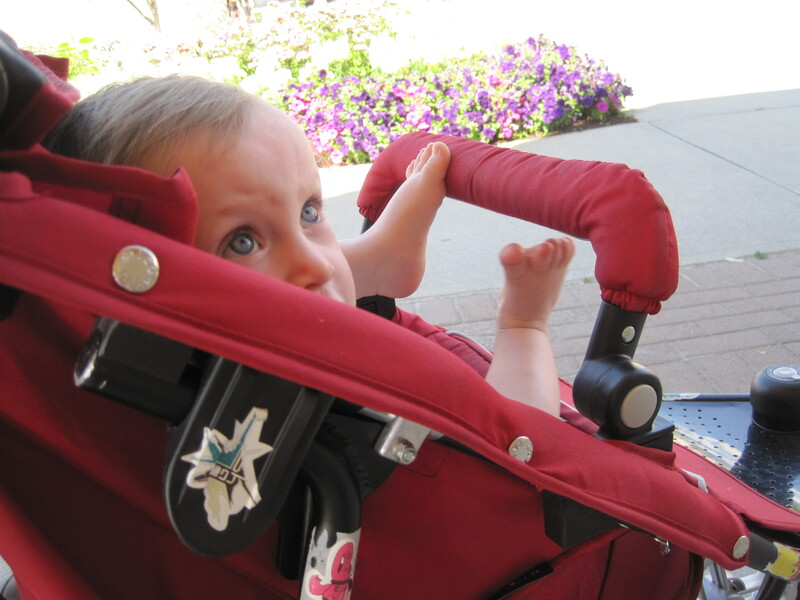 So I bought the bright red stroller for wonderful grand-baby – and was shocked at what a buggy cost! That said, I do remember saving hard for a double buggy when two of my own darlings were eighteen months apart, and in fact this stroller is built with the future in mind. When you have baby number two you can purchase another contraption for the teeny new one to lie above this one (or something convoluted like that) and IF number two is followed by number three, everyone shoves over and you buy a little step to attach to the back so number one’s little feet still don’t have to do the walking! 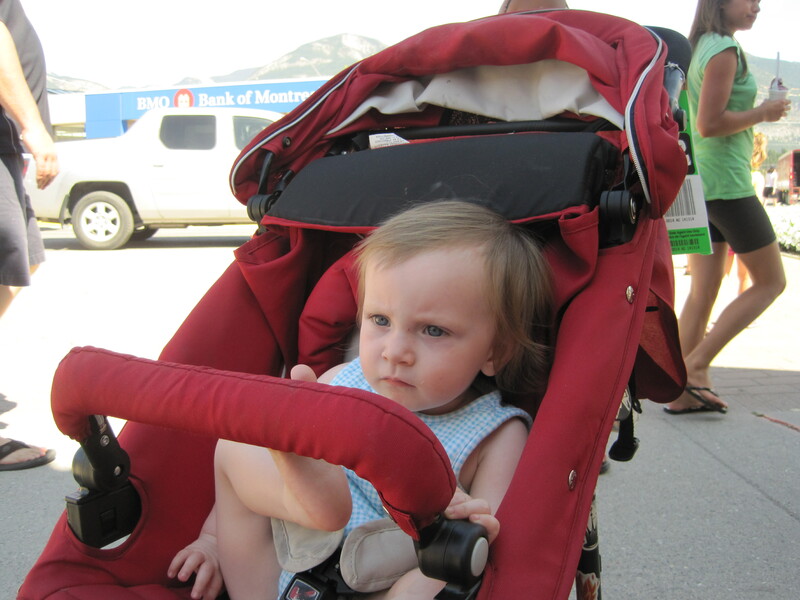 So one-year-old granddaughter was in my charge while we visited Windermere B.C. and I took her to ‘town’ to have a little stroll around and pretend people were whispering, “Mom, or grandmom?” Of course, the gig (in my dreams) was up when baby woke from napping and I needed to adjust the stroller back to let her sit up, and had to ask a youthful shop owner (of childbearing age) to assist me. 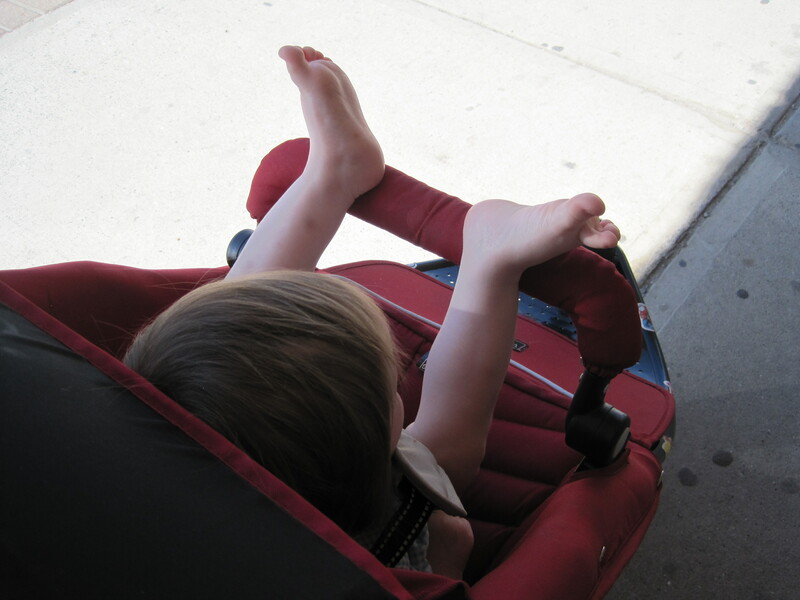 Baby and I wandered off down the sidewalk window shopping, with me picking up her flowery sun hat as she threw it down (“good game, silly grandma”) until I noticed that now the fancy buggy straps were so loose grand-baby could haul up and run off if she so desired. I was struggling to tighten them – baby bouncing on my lap and stroller sliding all over the walkway when a kind couple came by – my peers, I might add and the silver haired gentleman, introducing himself as a experienced grandfather, offered to assist. Okay, we were all – the other couple and I, the grandparent type you see on the vitamin bottles in my bathroom – the just barely 50, might need a boost of vitamin type, you know that fit, but slightly graying sort from the freedom 55 comercials frolicking on the beach? But could any of us fit-frolickers understand that millennium baby stroller? Nope – for full comprehension we needed a buggy from the eighties. I finally had to tell this guy thanks for his trouble but obviously the darn, modern, high tech stroller had outwitted us all. I slid baby back in and had the forethought to ask my would-be helper to demonstrate the four-way clip that held the whole harness together. He obliged, but I guess, given the circumstances, my short attention span was timed-out. After I fed my dolly a cup of strawberry ice cream for her lunch, I figured we should make our way back to the car. There I was in front of my ride trying like mad to undo that child-proof four-point clip and thankful that grandpappy and I had never tightened the darn harness, as it was becoming clear that if we would have succeeded I’d have had to abandon my vehicle and stroller stuck-baby many miles back ‘home’ – instead I was taking off her shoes and preparing to lift and slide her out of the bottom harness when who should rescue us? Kindly grandfather-man, probably wondering why I hadn’t paid closer attention last time. Okay, I’m definitely the grandma – the universe was making that loud and clear – baby’s mom was at a music festival calling up her mis-spent youth and dancing her little heart out, and I was considering how badly I needed a teeny little afternoon nap.